The Premier League action returns this weekend following the international break and we have a potential cracker at Anfield causing the most attention. Liverpool are facing a daunting prospect against Spurs and will be determined to claim what will be crucial three points in the title race against City. Reds are coming off from a positive period which – despite the apparent drop in form to their key player Mohamed Salah – got them through into the Champions League quarterfinals. The Spurs will be equally motivated to kick back the EPL action with a bang and should be expected to go full force against Jurgen Klopp’s men. They have been installed as underdogs, however, with 888sport pricing them at 33/1 in their new customer exclusive. 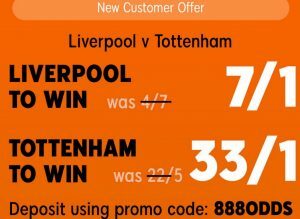 The same offer has Liverpool at 7/1 available to all new players who register an account using this link and make a deposit with promo code 888ODDS. Minimum of €10 is required for the deposit while all qualifying bets need to be placed at the normal odds. Extra winnings are paid in free bets. 18+ only. Please gamble responsibly. Terms and conditions apply.